They may be our cute furry friends who we love to share cuddles, kisses, and even our bed, but unfortunately, our trusty amigos are also vehicles for a number of germs that can make us humans sick. While some of these nasty things are more contagious than others, it doesn't hurt to be fully aware of them all! Believe it or not, Ringworm is not a worm, as the name leads you to believe, but in fact, a fungal infection which affects your dog's skin and can also migrate to other parts of the body, for example, it's claws (ewwww!). It's also the most common and contagious disease a pet owner can catch from their dog. 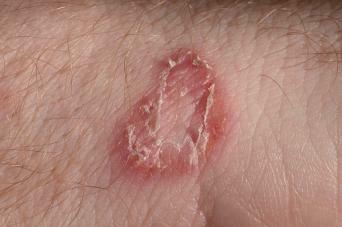 Ringworm is incredibly infectious and can be passed from you to your dog by simple contact with the area. It can be a real stickler to fully eliminate, as it can continue to be ping-ponged between the infected animal and person before the infection is fully cured. Avoid this cruddy skin complaint by washing and disinfecting your pet's bedding, eating utensils and any soft furnishings they may have touched, hoovering and dusting regularly to remove any ringworm spores shed in the home. And as hard as it may be, don't let your dog sleep on your bed or share the sofa with you while infection is lurking (sob!). Otherwise known as Toxocariasis, this is an infection transmitted from animals caused by the parasitic roundworms commonly found in your dog's intestines. Anyone can be infected by accidentally swallowing scuzzy dirt that has come into contact with dog feces that contain the infectious Toxocara eggs. Approximately 13.9% of the U.S. population has antibodies to Toxocara suggesting that many of us have already been exposed to the Toxocara parasite (yes, really!). Tapeworms are long, flat worms that attach themselves to your dog's intestines. They can take up residence in a person's intestines when transferred by ingesting traces of contaminated feces, or when a person (accidentally, hopefully) swallows an infected flea. 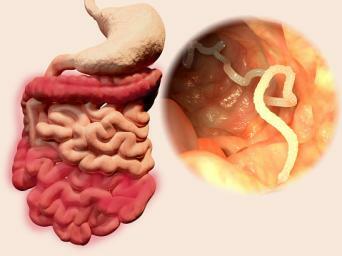 Truly creepy sounding, you may not know you have tapeworm until you see traces of the worm winking back at you from your own own feces when you go to the toilet. Certain types of tapeworms found in dogs may cause serious disease in humans and when left untreated, can form cysts in the human body (often occurring in the liver and lungs), which can grow to over a foot in diameter (holy moly!). Surgical removal is often required to cure the disease. Fortunately, these types of tapeworm are rare in the United States and the risk of catching tapeworm from your furry friend is fairly low. To prevent tapeworm infections in dogs, administer a monthly heartworm preventative that contains a drug specific for tapeworm infections. 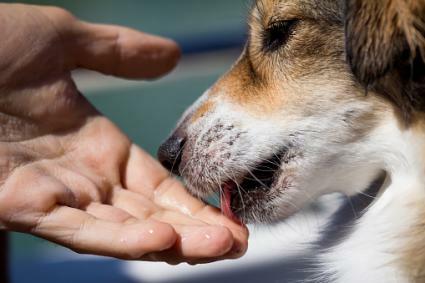 To stop transfer to humans, wash your hands after interacting with your doggy and before preparing or ingesting food. Campylobacteriosis is a bacterial infection which is usually found in puppies younger than six months old, but which can also be found in the gut of older dogs too. In fact, up to 49 percent of dogs carry this funky bacteria, shedding it into their feces and leaving humans at risk of contracting it too, if you go slack on the hygiene front. Interestingly, Campylobacter is also currently the most common bacterial cause of food-borne illness in the United States, producing more infections than either Salmonella or E.coli. Although those infected with Campylobacter bacteria may have mild symptoms, which are centered around a few loose stools per day, it can also develop into fever, headaches, muscle ache, nausea, diarrhea, and vomiting. Think we'll pass on that one, thanks! If a zoonotic infection were to be made prom queen, Brucellosis would take the crown. The most infectious of them all, Brucellosis is transmitted either by eating infected food products, inhalation of aerosols, or the easiest way ever, direct contact with an infected animal. Basic signs include flu-like symptoms such as chills, fever, fatigue, and muscle/joint pain, to name a few, and come sometimes disappear and come back for another visit weeks to months later, sometimes sticking around for years, even after treatment has been administered. Signs in your dog can also include lots of issues down under, as well as possibly having difficulty walking and lethargy. Believe it or not, the best way to prevent Brucellosis in your dog (and therefore you), is to spay or neuter them, as one of the ways they can contract it is through sexual activity, but also preventing situations where there is the direct interchange of fluids between dogs is important. Giardia is a parasite that lives in your dog's intestine, infecting older dogs and puppies. It enters their system when they swallow the parasite which may be lurking in water or other matters tainted with feces. While many dogs infected with Giardia do not get any disease, if it does develop into Giardiasis, the disease caused by Giardia infection, it usually results in diarrhea. While chances are slim, your tail wagger could possibly pass this lovely little treat of a disease on to you. How to prevent it? Safe, clean, drinking water is the best way to prevent your dog from being infected, as well as the all-important hygiene factor, especially when handling your pet's feces. Wash those hands, and wash them well! 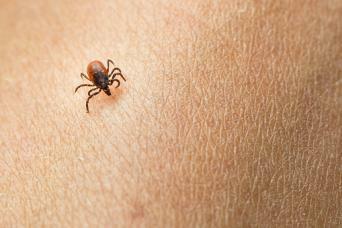 As if catching ticks from a deer wasn't bad enough, adding insult to injury is Lyme Disease. The deer tick is the most common carrier of Lyme disease, which is caused by bacteria transmitted by an infected tick when it feeds off your dog. And while you can't get Lyme disease directly from your dog, you can get it from an infected tick that your dog might bring into your home. And when you get bitten, it can leave you with symptoms similar to the flu. Not detected early on, the bacteria that causes Lyme disease can get into the heart and nervous system, causing meningitis, with even more profound motor and sensory nerve damage if left undetected for over a year. Look out for early warning signs that you have been bitten and are potentially infected by a tick - such as a red rash with a "bull's eye" in the center. Leptospirosis, also known as fall fever or mud fever, affects both animals and humans. The disease is caused by the bacteria Leptospira, and the severity of illness can range from a dog being undercover and displaying no symptoms whatsoever to a fatal illness involving the kidneys, liver, and other vital organs. Dogs can spread these nettlesome bacteria to humans through their urine. After infection, don't be fooled - some dogs become long-term carriers and while seeming healthy, can compromise their families' health if hygiene falls to the wayside. In humans, symptoms can range from none to mild flu-like symptoms like headaches, muscle pains, and fevers; to severe with bleeding from the lungs or even meningitis. In serious cases, when infection causes a person to turn yellow, they may have kidney failure and bleeding, otherwise known as Weil's disease. 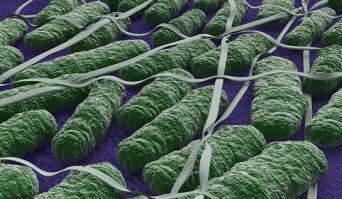 So you thought you could only get salmonella from eggs and raw chicken? Wrong! You can actually get it from your pooch too. The infection Salmonellosis is no joke as it often leads to intestinal disorders, miscarried pregnancy, and blood poisoning. Incredibly, there are more than 2,000 different types of Salmonella, and a host animal carrying the disease will typically have two or more different types in their system. A dog infected with the bacteria will usually not show any symptoms, although on occasion they will show symptoms of gastroenteritis. As usual, strict hygiene is essential for preventing further spread of disease, which is often shed in the infected dog's stool. If your dog loves the great outdoors, rabies prevention is absolutely essential. Passed on primarily through saliva, your dog runs the risk of catching this potentially deadly disease either through a bite from an infected animal, which is the most common way, or when saliva is makes contact with an open scratch or wound. Because rabies is considered zoonotic (diseases that can pass between species), this is a disease that you can catch from your dog the same way that they may have contracted it - from a bite, or contact with their saliva to an open wound or scratch. Unfortunately, symptoms can go undetected at first and by the time they start to show, it's often too late. Your best defense against rabies for both you and your dog is through vaccination. Also, if you believe your dog (or you) has had contact with a rabies-infected animal, you should wash the wound immediately with soap and water, apply an anti-septic such as ethanol to the affected area, and seek urgent, medical attention. Although the chances of getting sick from your own dog are relatively low, it is still important to keep good hygiene to ensure that you don't get sick from touching your dog, its saliva, or feces. Infants, children under five years old, and those with compromised immune systems are as a rule at greater risk. Practice good hygiene and common sense to make sure that the only thing you get from your prized pooch is their unconditional love!